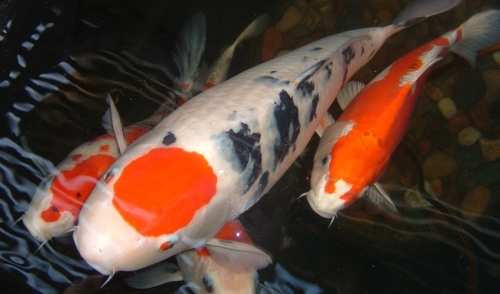 Preparing Your Koi Pond for Fall and Winter | Starkie Bros.
As summer comes to a close and fall settles in, temperatures will begin to fade. When the temperature outside drops, the temperature of your Koi Pond will also fall. Preparing your pond for fall and winter is a challenging task that requires many steps. The process will begin where it started, with the Koi. Slowly stop feeding your fish because when the temperature of the water gets colder, the metabolism of your fish dramatically slows down. If you’re lucky, your fish have been feeding on high protein food sources all summer and therefore have built up enough stored fat to survive the winter. Once the temperature is finally consistently below 55°F, stop feeding your fish altogether until spring when the temperature is consistently over 55°F. Keep in mind as the organic matter begins to decompose in the pond due to the cold temperature, toxic gases are produced and can easily be trapped inside if the pond is iced over for a long period of time. You can avoid this by purchasing a floating pond de-icer, which floats in the pond and activates a built-in heating thermostat when the water drops below 40 degrees. If you have a smaller pond, pond de-icers can keep your pond from freezing solid saving the lives of your fish. Protecting your fish is of the utmost importance. Add a leaf netting to keep leaves and animals away from your pond. You can also visit your local hardware store for more items that can help protect your fish during this time of vulnerability. The next big thing to consider is the plants in your pond. Slowly stop feeding your plants and remove any dead foliage from the pond. Make sure all plants that are intended to stay in the pond are planted deep enough to keep the roots from freezing. Practicing lowering your plants below the ice zone is your best bet when preparing your pond for the fall and winter. Some plants don’t like the cold temperatures and will need to be removed from the pond and planted outside or indoors until spring when new growth starts. The last part of the pond to take care of is the pond itself and water and equipment inside it. Start by removing as much plant debris and waste from the bottom of the pond as possible by skimming, vacuuming, and netting. Double check your pumps and filters to make sure they receive proper maintenance and are in good working condition. This important because if you live in an area where the temperatures are typically above freezing, you want to keep your pump and filter running through the cold season. If your area tends to get pretty cold, feel free to turn off the pumps and filter as any bacteria present will be less active or frozen. Cold water also holds more oxygen and since the fish’s respiration and metabolism slows when it’s cold, you won’t really need any extra circulations or aeration. Any external pumps, U.V.s, and pipes should be cleaned and stored until spring. When it’s all said and done, perform a 25 to 50% water change using a good de-chlor to remove any last bit of toxins and to make sure your Koi and plants are safe to make it through the cold months that lie ahead. Taking care of your Koi can require a lot of effort, but once you are finished, you can feel at peace that your hard work will not go to waste when spring arrives. Feel free to contact us anytime with comments or questions. Our trained staff is ready and waiting to help you. Use this form to contact us and we'll be in touch soon. © 2019 Starkie Bros. Garden Center. All rights reserved.